Today, EW posted an interview with Dave Filoni, "'Clone Wars' director Q&A: Final episodes answer big 'Star Wars' questions." We have included two excerpts below be sure to read the full story at EW for more information. One highlight from the interview is when Filoni was asked if these episode are the ending. "So does the show have an ending? Or is 13 where the production basically stopped? Filoni: One of the reasons I was okay with us ending when we did and production shifting from Clone Wars to Rebels is I liked the idea of having this Yoda arc available to us because I felt like this was a great place to have an ending if it’s going to end. There’s been so many threads throughout the five seasons, if you were to try and wrap them all up each one would be its own big episode. Here we have two story acts within this the 13 that have a strong connection to the franchise, they’re very important to understanding the overall saga. They’re [creator George Lucas'] last statement about Yoda and The Force and how things fit together. If you’re a die-hard fan, they’re absolutely must-watch story content. As I think fans realized, this wasn’t just fun storytelling in the Star Wars universe. These were very much George Lucas’ stories and he felt they were as important as his other work." 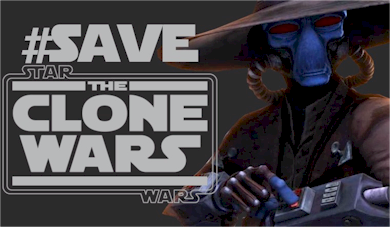 Another highlight from the interview is when Filoni was asked about the possibility of a continuation of the stories of The Clone Wars. "So is this firmly It? No chance of any additional content, such as a two-hour special or something, to wrap up some more story threads? Filoni: I always think of Yoda in these moments — the future is always in motion. Projects you think are no-brainers stall, and other things see the light of day. You never count anything out. I know the stories that are untold. I think they’re great. I’d love to see them told in some medium, some how. I’ve become a protector of those stories. [Lucasfilm president] Kathleen Kennedy understands the value of the stories we were going to tell. I’m sure we’ll find a way to find root for them in some manner in the future. I hope to be around for a long time."